Virtual Business Solutions Real Estate is committed to bringing our clients more value in 2019! We have partnered with another business in our industry to offer you a wonderful, exclusive offer. This limited time offer is brought to you by Bob Mortgage! They are offering all VBSRE clients an unreal deal! Contact us today to find out more! In February 2019, our team came together in Dallas for a team building DISC Assessment exercise with the G.O.A.T - Eric Thomas! He takes the DISC assessment to a different level with the Animal Assessment and taught us how to communicate effectively with each other and any personality we come across. This day will be in the history books! We are proud to partner with North DFW Real Producers! We are so excited to be featured in the magazine and look forward to developing a great partnership and friendship! 4 years ago Real Producers Magazine was a just a cool idea. Now we are in over 50 markets across the United States and expanding like wildfire! North DFW Real Producers being one of our most recent markets. What is it? Who is it for? What value does it provide me and my business? We are telling the stories of the top 500 real estate agents within North Dallas Fort Worth. In just North DFW alone, there are ~20,000 real estate agents. Yes, that is right. 20,000. Of that, the top 500 agents are doing over 80% of all the business. These are the agents who make the market what it is. They take this job seriously and they are doing it at an extremely high level. We have a tremendous amount of respect for these agents. If you heard real estate was easy, you heard from an ill-advised source. Just ask one of our agents - they will set you straight! The mission of Real Producers is simple. We strive to inform and inspire the top producing real estate agents in the local market and connect them socially. The secondary focus is to provide an avenue for our affiliate partners to create relationships with these top performers on a level that they might not be able to achieve on their own. Give away books you have read. Share what you’ve read with someone else who might be interested in reading it for free! Give more hugs. Apparently humans need 12 hugs a day for growth. Start hugging more! Send Thank you notes. Not just for special occasions, but for everything! Pay it forward. The next time you’re in line at a drive-thru or tollbooth, pay for the person behind you, just because! Be nice to someone you dislike. You gotta kill ’em with kindness, right? Do what you say you’re going to do. Always keep your word. Stop complaining. Your positivity will encourage others to do the same. Buy someone flowers for no reason at all. Let someone in the checkout line go ahead of you. This is always extra nice when you can tell someone is in a hurry or has kids with them! Write notes to your loved ones and put them in their jacket pocket, car, suitcase, lunchbox etc. What are some ways you show kindness? We’d love to hear your tips and ideas! 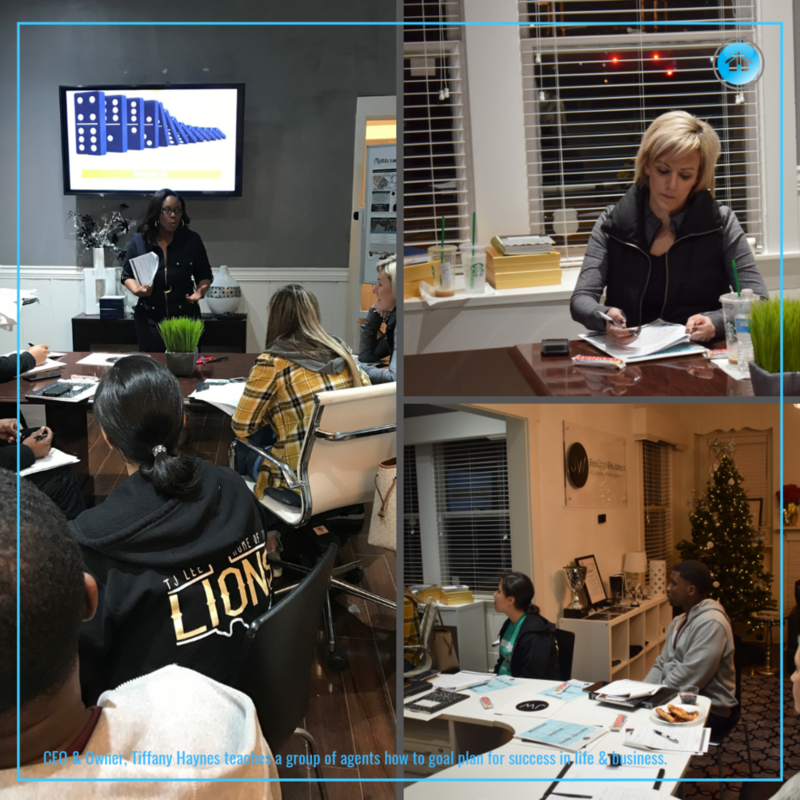 I had the pleasure of hosting a Goal Planning Class back in December with a great group of agents! This Goal Planning course is an interactive goal planning blueprint session that keeps you aligned with your highest and best self in life AND business! We work through to discover your true WHY for what you are doing, we define your vision to help you better create a goal plan and be able to implement a system that actually works for you. We share tips on how to remove obstacles, incorporate small tasks into your every day in order to reach those long term goals and help you learn how to set yourself up for success! Thank you again to these amazing individuals for being a part of an amazing day! I hope you learned a lot and will take all that you learned with you for a super successful 2019! Working in a place where Christians are the minority can often be challenging. You might be tempted to hunker down, do your work and then rush home each day. But instead of quietly surviving, God has called us to be a light in the darkness. That means we are to shine brightly and not cower in our cubicle. To speak truth in love, not simply conform to the attitudes and beliefs of our co-workers so as not to make waves. We are to be the bright spot in a dark world, proclaiming the love and salvation our Savior has to offer. It’s easy to fall into the speech habits of those around you. Ephesians 4:29 tells us to speak only words that will be uplifting to others. Hang a decoration with encouraging words near your desk to remind yourself to trust God in all circumstances. Having His truth as a constant reminder can help you think before you speak. Stress, dreaded tasks, uncooperative co-workers, lack of recognition...there are numerous things in your workplace that can bring you down. But, how do you react? Do you grumble and complain or do you choose to trust God and be positive? Remember that you can do all things through Christ who gives you strength (Philippians 4:13). Rest in the assurance that God will get you through every situation, and show others what it means to have the joy of the Lord, no matter the circumstances. Place a reminder at your desk to praise God and focus on His goodness. Believe me, people will notice. Another way to witness is to simply let God’s Word speak for itself. Drink your morning coffee in this "Faith Over Fear" mug and take it with you to your team meetings. You can also place Scripture shareables prominently on your desk. These are non-confrontational ways to present the Word to your co-workers and plant a seed in their hearts. After all, you never know how it will touch or convict them. It’s hard to find obvious opportunities to talk about your relationship with Jesus when you’re on the clock. An easy way to get some one-on-one time, however, is to invite a co-worker to lunch. Genuinely get to know them as you talk about more casual things like kids, hobbies and activities. Eventually, the Holy Spirit may open a door for you to speak about your relationship with a loving God. Pray Ephesians 6:19-20 before you go and ask the Lord to open doors for His Kingdom to be released in your interaction. You’ve heard the saying “actions speak louder than words.” Often what we do can be an even louder witness than what we say. Look for opportunities to serve your fellow co-workers. Give a sweet baby gift to someone out on maternity leave or send a sincere sympathy card to a co-worker who recently lost a loved one. Other ways to serve might include offering a ride to someone whose car is in the shop. If you have Christian music playing in your car, the lyrics of a song might minister to them. Through you, these small actions can speak volumes about God’s immeasurable love for your co-workers. Did You Know? E-Newsletters Work! You can’t be everything to everyone that you’re trying to touch, and you have to have some type of an umbrella that takes that burden off of you because you’re realtors trying to run a business, not email marketers. You’re not social media gurus. You’re realtors with valuable time, and you need to be concentrating on other aspects of your real estate business. E-Newsletters give businesses the opportunity to regularly communicate with customers and leads who have expressed interest in their company, making them a very warm audience. So what are the benefits of E-newsletters? Email is a Preferred Method of Communication. Today, email is one of the most popular forms of communication. By sending marketing materials to an email address, you ensure that you deliver your communications to a platform where your audience is nearly guaranteed to be spending time. In fact, 93 percent of internet users have indicated that they'd rather receive brand information in their email inbox versus their social media feed. So, by using email newsletters, you're ensuring that you're reaching people where they actually want to be reached online. Newsletters Help You Narrow Your List of Quality Leads. If someone signs up for your email newsletter, they've expressed an interest in your company - and have in turn become a lead. Once they begin to receive your newsletter, they may decide they are even more interested in doing business with you or that they no longer want to receive your communications. Email newsletters give consumers the ability to easily opt out of your list, which means that you can weed out the people who actually are not viable sales leads - and focus on the people who are still interested in becoming your customer. You Can Brand Yourself. Email newsletters are a great opportunity for a company to provide valuable, practical information and to show off what they know. For that reason, email newsletters can help you prove that you are a leader in your industry and a company that is worth doing business with. They Help You Stay at the Forefront of Customers' Minds. If you have a regular email newsletter, you can continuously remind current and potential customers that you exist. Many consumers get busy and forget about a company they're interested in without meaning to divert their attention. A regular email newsletter is a simple reminder that you're there and that you have a service or product to provide. You Can Schedule Them In Advance. Like all facets of your business, when it comes to marketing, time is money. Luckily, an email newsletter can be crafted in advance, then scheduled and sent out automatically by using marketing automation software. By automating your marketing messages, you can free up time to work on other parts of your business, and also ensure that you are sending out the newsletter at the optimal time of day. The ROI of Email Newsletters. With a low cost of operation to supplement all the benefits listed above, it’s no surprise that email newsletters generate a strong return on investment. In fact, a recent survey of marketers showed that email marketing was the most successful channel for digital marketing, especially when it comes to ROI. Sixty-eight percent of marketers surveyed reported that their ROI for email marketing was either "good" or "excellent." email marketing tactics had a median ROI of 122 percent. This means that email marketing pays off more than many other marketing techniques, including social media, direct mail and even paid search. Email newsletters are a simple, convenient digital marketing technique, which can be helpful for a busy marketing team. You can use email newsletters to easily reach customers where they spend time - and not only can you provide value to them, you can also maintain them as a long-term customer. Are you ready to reach your clients in an affordable, efficient and quality way? Hit the button below to learn about how our VAs can help! I'm Ready to Start E-Newsletters! When you get measured at the doctor's office, does the medical professional use a random stick to reveal your height? Hopefully not. If they did, you might be 3½ sticks tall in one doctor's office and 12 sticks tall in another. That sounds ridiculous, right? But when it comes to measuring self-worth, many people use something just as unreliable as a random stick. You may not even consciously think about what type of stick you use to measure your self-worth. But it's likely that, deep down, you know. After all, when you feel like you're measuring up, you feel good about yourself. But when you feel as though you've fallen short, your self-esteem likely plummets. So while you may be aware of those fluctuations in how you feel, you might never stop to think about what type of measuring stick influences you so much. Some people measure their self-worth by the numbers on a scale. Others determine their value by how much attention they can attract with their appearance. The media sends a message that "you're only as good as you look," and many marketing strategies target people's insecurities over everything from weight gain to aging. That's not to say good looks don't serve as an advantage in life; they certainly can. But a beautiful body or a handsome face won't last forever, and hair loss, wrinkles, and a middle-age spread can feel catastrophic for someone whose self-worth depends on their physical appearance. You likely know at least one person whose self-worth is measured by their income or material possessions. But people who measure their self-worth by their net worth may never feel "valuable enough." And it's not just wealthy people who define themselves by the size of their bank accounts — many people live beyond their means in an attempt to feel "good enough." But going deep into debt to create a façade of wealth backfires in the end because while goods and services have monetary value, they don't reflect your value as a human being. There are several ways people depend on others to give them value. While one person may only feel good about herself when she's in a relationship, someone else may feel as though name-dropping well-known people will gain the admiration from others he needs to feel good. Some people only feel worthy when they can surround themselves with important people. A lengthy list of personal contacts and a busy social calendar help them feel valuable and important. But depending on other people to make you feel good is like chasing a moving target. You can't control what other people think of you, and you certainly can't please everyone all the time. You'll never be able to receive enough praise and positive reinforcement to genuinely feel good about yourself. A career helps many people feel worthwhile. In fact, many people introduce themselves by saying what they do: "I'm a computer programmer," or "I'm a lawyer." Their job isn't what they do — it's who they are. Their career reinforces to them that they're "somebody." But basing your self-worth on your job title is a big risk. An economic downturn, unexpected shift in the job market, or a major health problem can put an end to your career and lead to a major identity crisis. Even a planned retirement may destroy your self-worth if your identity is tied to your job title. If you've always measured your self-worth by what you do, you won't feel good about yourself when your career ends. Sometimes people want to be known solely for their achievement. That person who brags about her latest business success may only feel good when she talks about her accomplishments. Or an individual who just can't stop beating himself for a mistake he made might struggle to move forward, because he didn't achieve what he needed to feel good. While it's normal to feel proud of your accomplishments, basing your entire self-worth on your achievement is like building a house on an unsteady foundation. You'll need to experience constant success to feel good about yourself — and that means you'll likely avoid doing things where you could fail. The way you choose to measure your worth affects the kind of life you'll live. Use a measuring stick based on factors you can control — not the external events in your life. When you know who you are — and you're pleased with the person you've become — you'll experience a sense of peace through life's inevitable ups and downs. You'll believe in yourself regardless of whether you've been fired, gone through a divorce, or failed to get a promotion. Are you determined to get your business goals met in 2019? Do you have so many marketing ideas in your head and not enough time to implement them? What if you could relay those ideas to someone else and they could draft up the designs for your approval and then order and execute them while you go out and meet with clients? The job gets done… in more ways than one. You give us the task, we’ll complete it. We handle Marketing tasks from postcard and business card designs, to website and social media platform creation, to customized listing presentations and more! If you have an idea, we will do our best to make it come to life! Take a look at some of our frequently used marketing services and give us a call to discuss your marketing needs! Plan Your Day, Week, Month, and Year with Beyond Routine! At VBSRE, it’s important to stay organized and prioritize our tasks for the day… and the week! What better way to get that done than with a Beyond Routine Planner? Beyond Routine planners are designed to be your vision guide. To help garner goal-oriented results that you can be proud of. To ensure you have all aspects of your business on your radar so that you don't lose momentum by only focusing on the things you enjoy doing. Your Beyond Routine Planner is designed to be your personal assistant, accountability partner, motivator, and instructor. It’s an assistant for our Virtual Assistants! And it’s more than just another planner with a calendar and time slots. It tracks your water intake, has pages to write out your Dream Year and your goals for 5 and 10 years from now! It inspires you with a new quote each month, it keeps you in check for your fitness goals and did we mention it comes in an array of gorgeous styles and designs?! If you’re ready to get your work week on track… and your life goals too… you need to get yourself a Beyond Routine planner! There is nothing routine about it… it truly goes beyond what other planners can do. Excuses can be pretty powerful. They can hold us back and leave us in a cycle of procrastination. They are that inner voice within that tells us we're not good enough, worthy enough, capable enough — the list of inadequacy goes on. All of this negative self-talk gets us nowhere. It keeps us paralyzed in our fears. We are all capable of getting the results we want, but results and excuses can't coexist. To get the results you want, you have to ditch the excuses. Invalidating our calling and our purpose leads to the excuses piling up one after the other. 1. Make a list of your fears. Do you let your fears run the show? Do they keep you in a cycle of excuse after excuse? Write them all down today. Create a list. Look at the fears and read them aloud to yourself. Seeing them on paper diminishes their value. 2. Write down what you're doing in response to these fears. After writing down each of your fears, write down what you are doing in response to each of these fears. Know that you cannot fail; by showing up and being the best version of yourself, you have not failed. The mind can play tricks on you, making you live in response to your fears. 3. Decide on five concrete goals. Put these five goals on paper. Look at them. Start to manifest them. Start to believe you can make them become a part of your life. 4. For each goal, come up with three action steps to help make them a reality. Create an action plan for yourself. This is what it all comes down to: ACTION. You can understand something intellectually, but it's a matter of bringing that down into the heart and taking the steps to make these goals and results your reality. 5. Create a one-day plan. Start small. Think about what you can do today to make the results you want part of your reality. Maybe it's talking with a friend about what it is you truly want. Maybe it's journaling about what inspires you, lights the fire inside, and brings about a sense of purpose and passion. 6. Tell someone about your plan. Accountability is everything. Knowing that you're not alone and that someone else is there on the journey with you is empowering. Tell a friend or family member about this plan. Start working with a professional to bring your ideas and visions to life. Remember, you can't do it all alone and the more love you let in, the more love you let out, and thus the more results you'll see. These changes all start with this one word: compassion. Without compassion, you're stuck in a cycle of fear and excuses. Compassion allows the love to flow through. It allows you to show up, be authentic, and create the life you want for yourself. You can be your own worst enemy and critic. Talk to yourself like you would talk to a loving friend or family member. Take in the fact that you have a choice each and every moment. Align this choice with the results you want for yourself. Thank You for Shaping Our Business! As the holiday season is upon us, we find ourselves reflecting on the past year and those who have helped to shape our business. It’s been quite a year for us all! We hope that 2018 has been just as memorable for you, your colleagues and your loved ones. We look forward to working with you in the years to come and wish you Happy Holidays! If we want to enjoy the holiday season more, we have to focus our efforts on being a little more present with ourselves and others. By making time to stay present, we can improve our relationships with others and connect with them more deeply away from our screens. Wrap Someone in a Hug. A hug is an expression of warmth and friendliness with arms outstretched around the other. Hugs are used as an expression of love, kindness, sympathy, friendliness, greetings and used sometimes to say goodbye. Tired of all the grinches who complain when the holiday season comes around? Rid the world of them by spreading some holiday cheer. You can make a difference just by baking cookies, listening to carols, or giving a little something to those whom we take for granted. Set aside five minutes each morning to sit quietly with a cup of Christmas blend coffee and just breathe. Use this time to ground yourself and prepare for the day that is to come. Beginning each day peacefully will help you to carry that peace with you for the rest of the day. Since not everyone is fortunate enough to have access to their loved ones, food, presents, or a home, the holidays are also an important time to spread cheer to those less fortunate. One easy way to give back to the community, whether you live in Hawaii, Alaska or any state in the contiguous 48, is to donate food, money or your time to a local food bank. Through their vast networks of food pantries and other agencies, food banks feed millions of food to those in need every day. What Does It Mean To Be the Light? It means doing things that make you feel free and peaceful, surrendering control, trusting your intuition, showing compassion and kindness to yourself and others, and believing the simple truth that you are enough. It is about bringing light to the places that are dark. It is about looking for opportunities to lift someone else up. It is about making a conscious effort to help other people recognize the light that is within them. We get it- the Real Estate Business can be fun up until the day in and day out tasks of managing your contracts. Title requesting documents for a closing while you are showing 4 homes. The follow up you want to give your client but you are with another client for 2 hours. The tactful way you want to address an escalated situation but your phone is ringing off the hook? VBS REAL ESTATE HANDLES IT ALL! CALL US SO WE MAKE YOUR LIFE EASIER! Review the contract for completeness and pursue necessary parties for outstanding initials, signatures and dates. Send agent an email outlining important dates and contact all parties involved in the transaction including the lender, title company, client and co-op agent; introduce myself and request that all paperwork and communications related to the transaction flow through me. Add all dates to your digital calendar. Establish file in your Broker system of record, upload documents and contact information. Weekly lender check in and more frequently when necessary. Coordinate inspections with you, the inspector, the Buyer and the co-op. On-going system of record maintenance as documents are submitted, changes are made via amendment, and we work through the transaction process. For Buyers: Collect 2nd Deposit check from Buyer and forward to listing agent. Send detailed email requesting home warranty selection and follow up until selection is made. Provide clients with reminders to connect or disconnect all necessary utilities and to secure homeowner’s insurance. Verify loan commitment with client’s lender, provide copies and notify you of any problems in underwriting. Order and review the title report. Notify you of any issues and help to resolve. Schedule final walkthrough and closing with your clients, the title company and you. Obtain final signed closing disclosures and upload to your system or record. Provide a congratulatory letter to your buyer(s) or a thank you letter to your seller(s) prompting them to leave a review for you with clickable links. Design Just Sold postcards and send out to the demographic of your choice (postage paid separately). Add client to your contact database with new address and email to be added to your past client drip campaign. We Have Coordinated 1,000 Contracts! Most people often assume that the road to success is a simple and straightforward one. The reality is that it almost always involves periods of uncertainty and challenges that will test us. For us to successfully navigate through this tricky terrain, it is critically important to learn how to manage feelings of any self-doubt and insecurities that may crop up along the way. Too often, we allow the voices of our insecurities to prevent us from moving forward in our dreams because we are afraid of failing. We measure our performance with a yardstick that measures our worth based on our popularity and financial gain. The truth is that if you want to stand out of the herd, you need a strong foundation of self confidence which necessitates the need to keep your insecurities and feelings of inadequacies in check. Do a SWOT analysis: This is one of the best frameworks to use when it comes to analyzing yourself and trying to find a way to differentiate yourself from your competitors. Manage your gremlins during the process: There may be times when you will feel your insecurities crop up. During these times, it is helpful to engage in “motivation-boosting rituals” such as glancing at your Dream Board, using visualization techniques, repeating affirmations that inspire you, and listening to motivational music. In this way, you can stay objective while you create your action plan. The key is to not let your insecurities, often triggered by others’ success, fog your mind and prevent you from seeing your potential for your own unique path. If you stay strong and focus on the big picture, you will gradually reach your desired destination, and along the way, you will realize that the real pot of gold lies behind the rainbow of love, self-expression, and contribution. IDEA Masters was created for individuals to share and network amongst like minded professionals that are constantly- Influencing, Driving, Envisioning, and Achieving in their day to day environments. Just a select few from our Mastermind group! From business developers, to business owners, to commercial investors, and realtors! Always sharpening the saw to better serve our clients! Our CEO Meets Up with VA, Jeani Codrey! Jeani has an extensive background in the real estate industry. She worked her way through college by managing rental properties and flipping houses with her mom. Jeani has an Associates Degree in graphic design and copywriting. After graduation, she started a small graphic design firm designing websites and advertising for real estate agents. Her mom wanted to build a real estate team and asked Jeani to get her Texas real estate license and come to work for her exclusively. Together they formed The PRO Team. They were the number one team in their office, brokerage firm of 5 offices and in their marketplace. The team eventually opened their own office where Jeani served as managing broker. During that time Jeani earned 9 real estate designations, her Texas brokers license and became a TREC licensed instructor. She is the creator of ten courses and training programs and serves on the faculty of the REALTOR® Academy at San Antonio Board of REALTORS®. Jeani believes in servant leadership and giving back as evidenced by her industry service record, being awarded REALTOR® of the Year in 2005 and earning a seat in the esteemed Texas REALTORS® Leadership Program. Jeani left real estate for a couple of years to take care of her business partner/beloved mom as her health failed and she ultimately passed. She made her return to real estate at the urging of her son who told her "Real estate is in your genes, it's time to go back!" Jeani returned as office manager of a real estate firm in San Antonio where she worked until April 2018. Why Virtual Assistant? On November 26, 2016, Jeani survived cardiac arrest and a massive heart attack at age 50. The events of that terrifying day forever changed the perspective of she, her family, and friends. A decision was made that day to change the course of life. Jeani and her husband Jerry decided to sell their home, buy an RV and travel the country full-time and the role of real estate virtual assistant was the perfect fit. She is dedicated to using her experience to help the agents she supports grow their business.